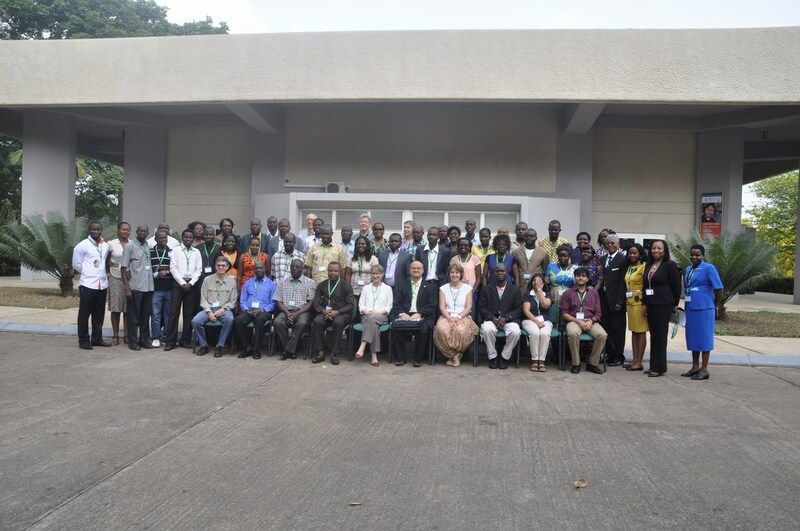 Members of the Alliance for Banana Bunchy Top Disease (BBTD) Control in Africa met at IITA, Ibadan, Nigeria, 9-14 March, to share progress made during the first year of pilot site implementation in eight countries in sub-Saharan Africa and to develop follow-up action. The meeting was attended by about 50 implementing partners from 11 countries. It provided a platform for refining the protocols for studying the BBTD epidemiology; mapping household and community social practices; ensuring clean seed production and supply; and developing a plan that consolidated and improved shared learning for implementation in 2015. Meeting participants in a group photo. BBTD, caused by the Banana bunchy top virus (BBTV), is the most devastating disease of banana for which no sources of resistance are available. The disease is spread through infected planting material and also by an insect vector—the banana aphid. Banana is one of the key staple crops supporting the livelihoods of an estimated 100 million people, most of who live in sub-Saharan Africa. Over 50% of the world’s production of banana (and plantain) is grown in the region. Bunchy top was first reported from Africa in 1901 and has spread extensively into new production areas during the last two decades. It recently invaded Bénin and Nigeria in West Africa and had a limited spread within the Kivu provinces of DR Congo, neighbor to Uganda, the largest banana-producing country in Africa. Currently, BBTD occurrence has been confirmed in 13 countries in sub-Saharan Africa. 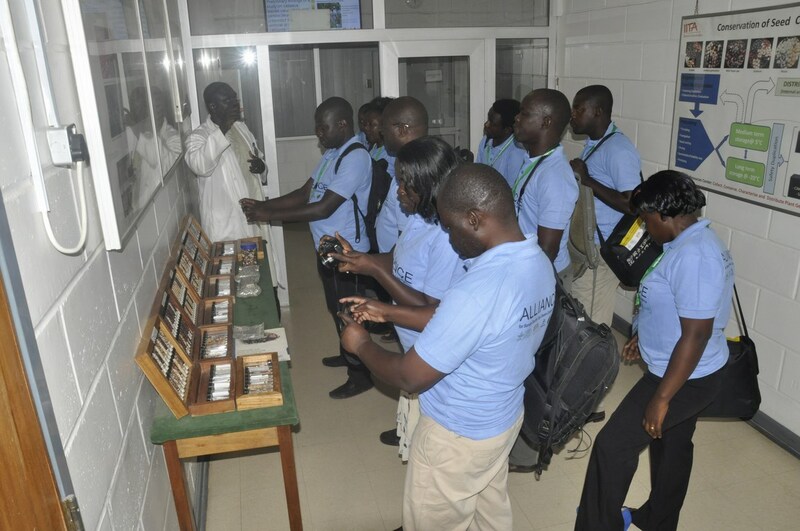 Alliance member-partners from the national programs visit the Genetic Resources Center. 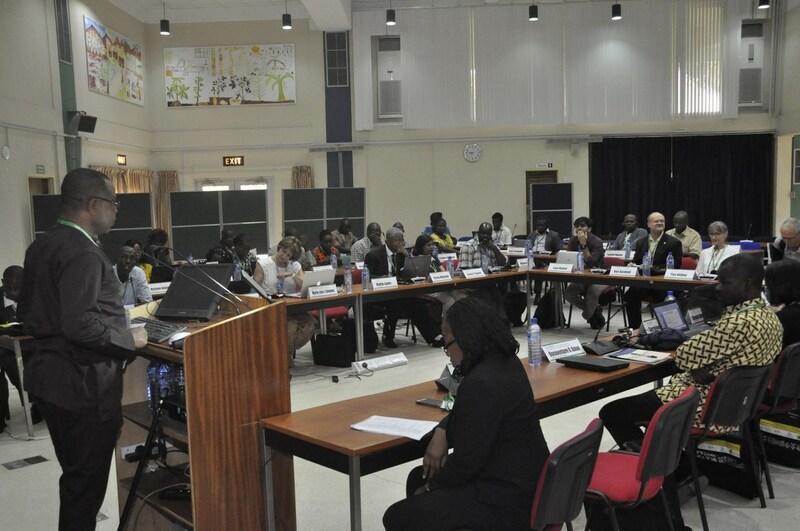 In February 2013, experts under the umbrella of the CGIAR Research Program on Roots, Tubers and Bananas (RTB) formed an alliance to implement medium and long-term strategies to control BBTD in sub-Saharan Africa. The ongoing initiative under this framework, Banana bunchy top disease containment and recovery in sub-Saharan Africa: Building capacity and piloting field recovery approaches through a learning alliance is led by IITA, Bioversity International, CIRAD, together with national partners in Bénin, Burundi, Cameroon, Congo Brazzaville, DR Congo, Ghana, Malawi, and Nigeria. The alliance is focused on field-scale approaches to the recovery of BBTD-infested areas. This includes (i) Eradication of infected plants, (ii) Design of a supply flow for BBTV-free planting material, (iii) Establishment of clean fields in the banana-free zone with virus-free planting material; and (iv) Development of capacity for disease diagnosis and control, including training farmers in producing clean planting material. “All sites have partnered with new communities to establish banana-free fallows and a supply chain for BBTV-free planting material and these partnerships are working well” said Charles Staver of Bioversity International. He also emphasized that the success of the alliance lay in the strength of the partnerships. The project is building on previous work to assess the extent of BBTV spread in the target countries. It evaluates banana and plantain landraces and synthetic hybrids in endemic sites to assess their performance against BBTD and the banana aphid. “This work has shown some Musa cultivars with a high degree of tolerance to BBTD that can be used in endemic areas,” said Rachid Hanna, Entomologist, IITA-Cameroon. 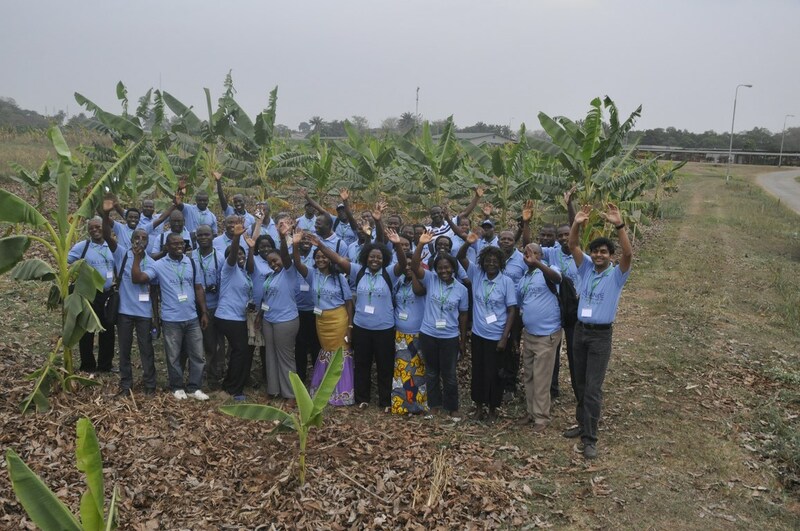 Alliance members during a tour of IITA banana fields in Ibadan, Nigeria, led by Lava Kumar (extreme right). said Marie-Line Caruana, Virologist, CIRAD. The project has also focused on building research capacity through three PhD and five MSc students on aspects of the cropping system, epidemiology and ecology of BBTD, varietal reaction to disease, and socioeconomic studies. The project has partnered with the gender and socioeconomic group of RTB to identify the household and community dimensions to mobilizing recovery areas from BBTD. the next phase,” said Lava Kumar, Virologist and workshop organizer, IITA-Nigeria. A session on ‘innovations’ was organized as part of this workshop and dealt with the latest initiatives to tackle BBTD through understanding virus-host-vector interactions, disease impact on planting material degeneration, transgenic approaches to develop resistance to BBTV and the banana aphid, understanding vector dynamics in relation to climate change, new propagation technologies using tissue culture and bioreactors, and the potential for youth agripreneurs in banana seed production. Experiences and lessons from BBTD management efforts in Australia were shared by John Thomas, Virologist from the University of Queensland, Brisbane, who attended as an external expert and appreciated the efforts of the alliance to control BBTD. The representative from the Nigeria Phytosanitary Service gives a talk. Participants were exposed to the phytosanitary and indexing procedures used to generate healthy planting material, the in-vitro conservation of Musa in the IITA gene bank, and the breeder’s reference collection in the field. As part of the program, participants visited BBTD-affected areas in Idologun, Ogun State, which is also the base for the Nigerian pilot site and interacted with farmers and community leaders about the action being taken to mitigate BBTD. Sunday Akinyemi (NIHORT) and Charles Onyeani (NAQS) outlined the scheme being used to recover banana production in the pilot site. Dr Claude Mvila from Congo Republic appreciated the involvement of the entire community, from leaders to laborers, in this initiative.